— Winner, Walter Lippmann Award for the Best Article in the Field of Political Communication, 2016, American Political Science Association Political Communication Section. Chadwick, A. (2015) ‘The “Social Media” Maneuver’ Social Media and Society 1 (1), pp. 1-2. Chadwick, A. (2014) ‘From “Building the Actions” to “Being in the Moment”: Older and Newer Media Logics in Political Advocacy’ The Nonprofit Quarterly 21 (1), pp. 54-61. Chadwick, A. (2011) ‘The Political Information Cycle in a Hybrid News System: the British Prime Minister and the “Bullygate” Affair’ The International Journal of Press/Politics 16 (1), pp. 3-29. Chadwick, A. (2011) ‘Britain’s First Live Televised Party Leaders’ Debate: From the News Cycle to the Political Information Cycle’ Parliamentary Affairs 64 (1), pp. 24-44. Chadwick, A. (2011) ‘Explaining the Failure of an Online Citizen Engagement Initiative: The Role of Internal Institutional Variables’ Journal of Information Technology and Politics 8 (1), pp. 21-40. Chadwick, A. (2009) ‘Web 2.0: New Challenges for the Study of E-Democracy in an Era of Informational Exuberance’ I/S: A Journal of Law and Policy for the Information Society 5 (1), pp. 9-41. — Reprinted in: Coleman, S. and Shane, P. M. (eds) (2012) Connecting Democracy: Online Consultation and the Flow of Political Communication (MIT Press), pp. 45–75. Chadwick, A. (2009) ‘Guest Editor’s Introduction: The Internet and Politics in Flux’ Journal of Information Technology and Politics 6 (3-4), pp. 195-196. Anstead, N. and Chadwick, A. (2008) ‘The 2008 Digital Campaign in the United States: The Real Lesson for British Parties’ Renewal 16 (3), pp. 86-98. Chadwick, A. (2007) ‘Digital Network Repertoires and Organizational Hybridity’ Political Communication 24 (3), pp. 283-301. Chadwick, A. (2003) ‘Bringing E-Democracy Back In: Why It Matters For Future Research On E-Governance’ Social Science Computer Review 21 (4), pp. 443-455. Chadwick, A. and May, C. (2003) ‘Interaction Between States and Citizens in the Age of the Internet: “E-Government” in the United States, Britain and the European Union’ Governance 16 (2), pp. 271-300. Chadwick, A. (2001) ‘The Electronic Face of Government in the Internet Age: Borrowing from Murray Edelman’ Information, Communication, and Society 4 (3), pp. 435-457. Chadwick, A. (2000) ‘Studying Political Ideas: A Public Political Discourse Approach’ Political Studies 48 (2), pp. 283-301. Chadwick, A. (1999) ‘Aristocracy or the People? Radical Constitutionalism and the Progressive Alliance in Edwardian Britain” Journal of Political Ideologies 4 (3), pp. 365–390. Chadwick, A. (1996), ‘The Past in the Present? National Identity and the Language of Constitutional Reform in Britain’ Studies in Ethnicity and Nationalism, Winter, pp. 3–9. Watts, E. and Chadwick, A. (2019, forthcoming). ‘“With and Between You All”: Celebrity Status, User-Audience Networks, and Representative Claims in Emma Watson’s Feminist Politics’ in Lind, R. A. (ed) Produsing Theory in a Digital World 3.0: The Intersection of Audiences and Production in Contemporary Theory. New York: Peter Lang. Chadwick, A. (2017) ‘Corbyn, Labour, Digital Media, and the 2017 UK Election’ in Thorsen, E., Jackson, D., and Lilleker, D. (eds) UK Election Analysis 2017: Media, Voters and the Campaign: Early Reflections from Leading Academics (UK Political Studies Association), p. 89. 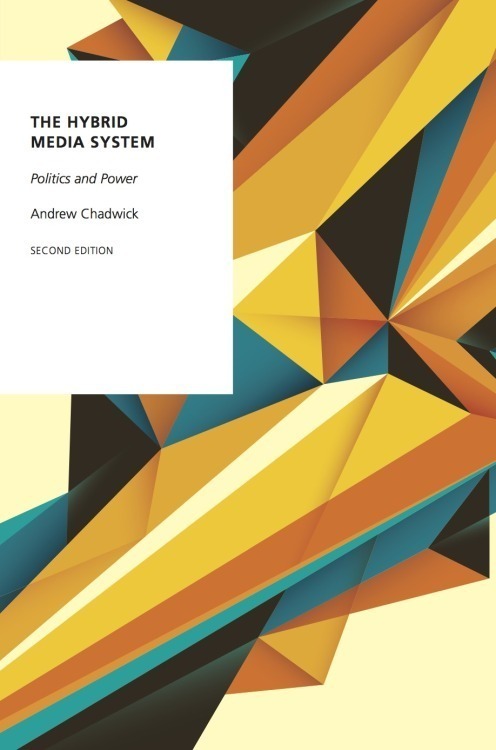 Chadwick, A., Dennis, J. and Smith, A. P. (2016) ‘Politics in the Age of Hybrid Media: Power, Systems, and Media Logics’ in Bruns, A., Enli, G., Skogerbø, E., Larsson, A. O. and Christensen, C. (eds) The Routledge Companion to Social Media and Politics (Routledge), pp. 7–22. — Free full chapter preview at Routledge’s site. Chadwick, A. and Vaccari, C. (2015) “Citizen Engagement in the Dual-Screened Election Campaign” in Thorsen, E. and Jackson, D. (eds) (2015) UK Election Analysis 2015: Media, Voters and the Campaign: Early Reflections from Leading UK Academics (UK Political Studies Association), p. 69. Ampofo, L., Collister, S., O’Loughlin, B., and Chadwick, A. (2015) ‘Text Mining and Social Media: When Quantitative Meets Qualitative, and Software Meets Humans’ in Halfpenny, P. and Procter, R. (eds) Innovations in Digital Research Methods(Sage), pp. 161–192. — Companion webpage at Sage. Chadwick, A. (2012) ‘Recent Shifts in the Relationship Between the Internet and Democratic Engagement in Britain and the United States: Granularity, Informational Exuberance, and Political Learning’ in Anduiza, E., Jensen, M., and Jorba, L. (eds) Digital Media and Political Engagement Worldwide: A Comparative Study (Cambridge University Press), pp. 39–55. Chadwick, A. and Stanyer, J. (2011) ‘The Changing News Media Environment’ in Heffernan, R., Cowley, P. and Hay, C. (eds) Developments in British Politics 9 (Palgrave-Macmillan), pp. 215-237. Chadwick, A. and Howard, P. N. (2009) ‘Introduction: New Directions in Internet Politics Research’ in Chadwick, A. and Howard, P. N. (eds) The Handbook of Internet Politics (Routledge), pp. 1-9. Howard, P. N. and Chadwick, A. (2009) ‘Conclusion: Political Omnivores and Wired States’ in Chadwick, A. and Howard, P. N. (eds) The Handbook of Internet Politics (Routledge), pp. 424-434. Anstead, N. and Chadwick, A. (2009) ‘Parties, Election Campaigning and the Internet: Toward A Comparative Institutional Approach’ in Chadwick, A. and Howard, P. N. (eds) The Handbook of Internet Politics (Routledge), pp. 56-71. Chadwick, A. (2006) ‘Citizen-centric government’, ‘Disintermediation’, ‘E-Democracy’, ‘E-Government’, ‘Internet governance’, and ‘Virtual agency’ in Bevir, M., Ansell, C., Choi, N. Hay, C., Smith, A. Wilkinson, R. and Zanetti, L. (eds) Sage Encyclopedia of Governance (Sage), pp. 79, 232-233, 256-257, 261-262, 484-485, 1011. The articles “E-Democracy,” “E-Government” and “Disintermediation” were later included in Encyclopedia Britannica. Chadwick, A. (2003) ‘E-Government’ in J. Feather and P. Sturges (eds) International Encyclopaedia of Information and Library Science (Routledge, Second Edition), pp. 152-154. Chadwick, A. and Heffernan, R. (2003) ‘The New Labour Phenomenon’ in Chadwick, A. and Heffernan, R. (eds) The New Labour Reader (Polity), pp. 1-25. Chadwick, A. and Heffernan, R. (2003) ‘New Labour in the International Arena: Britain and the Iraq War’ (supplementary online chapter for Chadwick, A. and Heffernan, R. (eds), The New Labour Reader (Polity). Chadwick, A. (2002) ‘Murray Edelman’ in May, C. (ed), Key Thinkers for the Information Society (Routledge), pp. 43-64. Chadwick, A. (2000) ‘A “miracle of politics”: the Rise of Labour, 1900-1945’, in B. Brivati and R. Heffernan (eds. ), The Labour Party: A Centenary History (Macmillan: Foreword by Tony Blair, Preface by Michael Foot), pp. 322-345. Chadwick, A. (1997) ‘Ideologies, Communication and Public Discourse’ in G. Stoker and J. Stanyer (eds), Contemporary Political Studies 1997 (PSA Conference Papers Volume) (Blackwell), pp. 62–73. Chadwick, A. (1996) ‘State and Constitution: Ideologies of the Left and Proportional Representation in Britain, 1900–1924’ in I. Hampsher-Monk and J. Stanyer (eds), Contemporary Political Studies 1996 (PSA Conference Papers Volume) (Blackwell), pp. 1551–1565. Chadwick, A. (1996) ‘The British Left and Constitutional Reform’ in C. Navari (ed), British Politics and the Spirit of the Age: Political Concepts in Action (Keele University Press), pp. 237–260. (2017) “Interview with Andrew Chadwick: Digital media democracy expert on tension between control and engagement, and need for less interesting research in his field.” Profile in the Times Higher, September 7, 2017. (2014) “All Political Communication is Hybrid: A Conversation with Andrew Chadwick About his Latest Book The Hybrid Media System. Politics and Power.” Interviewed by Mediascapes Journal (Italy). March 2014. Chadwick, A. (2019) “The Online Harms White Paper: Tensions and Omissions.” Medium, April 9. Bruns, A., Bechmann, A., Burgess, J., Chadwick, A., Clark, L. S., Dutton, W. H., Ess, C. M., Gruzd, A., Halford, S., Hofmann, J., Howard, P. N., Jones, S., Katzenbach, C., Liang, H., Lewis, S. C., Peng, W., Puschmann, C., Qui, J., Quinn, K., Rogers, R., Rossi, L., Russell, A., Stromer-Galley, J., van Dijck, J., Weller, K., Westlund, O., Zhu, J. J. H., and Zimmer, M. (2018) “Facebook Shuts the Gate After the Horse has Bolted, and Hurts Real Research in the Process.” Internet Policy Review, April 2018. Chadwick, A. (2017) “Corbyn, Labour, Digital Media, and the 2017 UK Election.“ Medium. June 9. Vaccari, C., Chadwick, A., and O’Loughlin, B. (2015) “These days we watch debates on two screens: TV and social media. And that’s good for democracy.” The Washington Post (Monkey Cage Section). December 15. Chadwick, A. (2015) Article on media, political leadership and digital media during the UK 2015 General Election campaign, for Oxford University Press’ Blog. May 6. Ampofo, L., Collister, S., O’Loughlin, B., and Chadwick, A. (2013) ‘Text Mining and Social Media: When Quantitative Meets Qualitative, and Software Meets Humans’ Royal Holloway New Political Communication Unit Working Paper, October 2013. 66pp. Chadwick, A. (2013) ‘Politics and Communications in the Hybrid Media System’ Hanover Communications Blog, October 7, 2013. Chadwick, A. (2012) “How Digital Petitions are Replacing Traditional Parties as the Engine of Modern, Popular Democracy” The Independent, November 19, 2012. Chadwick, A. (2009) “Back to the Future: Organizational Values and Online Campaigning.” Written version of my speech to the Progress/Blue State Digital conference “Labour 2.0: Campaigning for the Net Generation,” Canary Wharf, London, February 28. Anstead, N. and Chadwick, A. (2007) “Parties, Election Campaigning and the Internet: Toward A Comparative Institutional Approach” Royal Holloway Politics and International Relations/New Political Communication Unit Working Paper no. 5. October 2007. 12pp. Chadwick, A. (2007) “E-Democracy: Social Capital, the Public Sphere and Citizen Engagement,” Mass Communication Course Reader (Centre for Mass Communication Research, University of Leicester). Chadwick, A. (2006) “Author Response to Vivian Serfaty’s review of my book, Internet Politics” Resource Center for Cybercultural Studies December. Chadwick, A. (2003), “The Ugly Duckling: Is E-Democracy Being Disregarded by Government?,” VoxPolitics Bulletin Issue 20, November. Chadwick, A. (2002), “Will E-Government Mean Interactive Government?” Inform: Newsletter of the Institute of Information Scientists (February). Chadwick, A. (1997), “Communication on Ricardo Blaug, ‘Between Fear and Disappointment: Critical, Empirical and Political Uses of Habermas’” [Political Studies, 45 (1)], Political Studies, 45 (4), pp. 661–662. Chadwick, A. (2018) Review of Southwell, Brian G., Thorson, Emily A., and Sheble, L. (Eds.) Misinformation and Mass Audiences (University of Texas Press) in International Journal of Press/Politics. Chadwick, A. (2008) Review of Prior, M. (2007) Post-Broadcast Democracy: How Media Choice Increases Inequality in Political Involvement and Polarizes Elections (Cambridge University Press) in Journal of Information Technology and Politics 5 (2), pp. 255-257. Chadwick, A. (2007) Review of Garson, D. G. (2006) Public Information Technology and E-Governance: Governing the Virtual State (Jones and Bartlett) and Heeks, R. (2006) Implementing and Managing E-Government: An International Text (Sage) in Public Administration 85 (3), pp. 857–860. Chadwick, A. (2007) Review of Howard, P. N. (2005) New Media Campaigns and the Managed Citizen (Cambridge University Press) in European Journal of Communication 22 (2), pp. 239–241. Chadwick, A. (2006) Review of 6, P. (2004) E-Governance: Styles of Political Judgment in the Information Age Polity (Palgrave) in Public Administration 84 (3), pp. 786–788. Chadwick, A. (2005) Review of Bimber, B. (2003) Information and American Democracy: Technology in the Evolution of Political Power (Cambridge University Press) in Public Administration 83 (1), pp. 262–264. Chadwick, A. (2004) Review Article: Hall, R. B. and Biersteker, T. J. (2003) The Emergence of Private Authority in Global Governance (Cambridge University Press) and Paré, D. J. (2003), Internet Governance in Transition: Who Is The Master of This Domain? (Rowman and Littlefield) in Governance, 17 (4), pp. 593–596. Chadwick, A. (2003) Review of Newman, N. (2002) Net Loss: Internet Prophets, Private Profits, and the Costs to Community (Penn State University Press) in Political Studies Review 1 (2), pp. 239–40. Chadwick, A. (1999) Review of Brivati, B. and Bale, T. (1997), New Labour in Power: Precedents and Prospects (Routledge) in Political Studies 47 (1), p. 176. Chadwick, A. (1998) Review of Thorpe, A. (1997) A History of the British Labour Party (Macmillan) in Political Studies 46 (5), pp. 991–992. Chadwick, A. (1997) Review of Biagini, E. F. Citizenship and Community: Liberals, Radicals and Collective Identities in the British Isles 1865-1931 (Cambridge University Press) in Political Studies 45 (4), p. 806. Chadwick, A. (1997) Review of Evans, M. (1995) Charter 88: A Successful Challenge to the British Political Tradition? (Dartmouth) in Political Studies 45 (1), pp. 143–144.